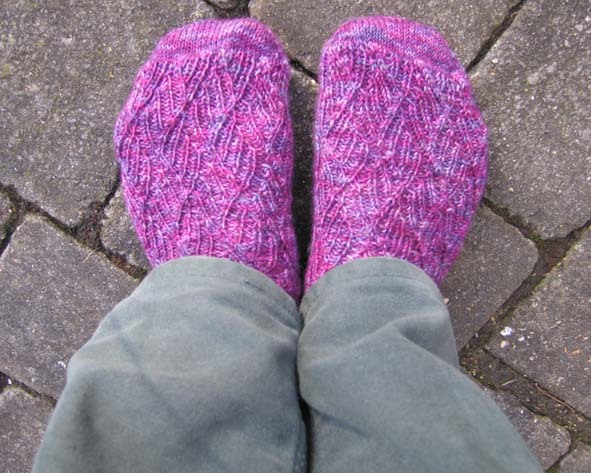 FO: Mountain Fruit Socks | carpe diem! I think I’m knitting faster. 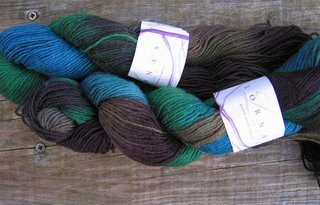 Or perhaps speed is a function of yarn quality: if I like it, the stitches fall effortlessly OK, almost effortlessly from the needles. I not only like this woolly, springy yarn (Piece of Beauty in ‘Mountain Fruit’), I like the stitch pattern, I like the way the ribbed lace grips my feet, I like the way it and Kirsty’s mottled dye technique work together. I think I’ve used ‘like’ altogether too much. Summed up, the above means ‘I love these socks’. Thank you, Kirsty! Socks 64st in total, which is a little small for me. So the instep is on a 2.5mm circular while the sole and heelflap were on 2mm, switching to 2.5mm at the top of the heelflap. This has worked really, really well: the socks are not tight, and stretch nicely to reveal the stitch pattern. I want to do these again in green/blue, like scales. I also tested a theory with these, namely that to fit properly, socks should be about a half-inch shorter than the measured footlength. Seems to work. Also, I must remember that the heel from end of gusset to flap takes about an inch, or at least my heel does. These were short-rowed from 32st down to 12, I think. Note the heelflap. Please note the PATTERNED HEELFLAP. 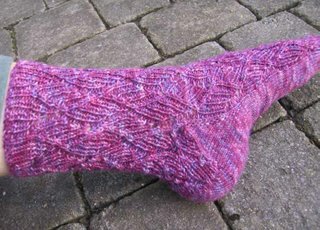 Most heelflaps done in pattern that I’ve seen are worked on top-down socks. There is a reason for this, and now I know what it is. Math. Simple math, but math. 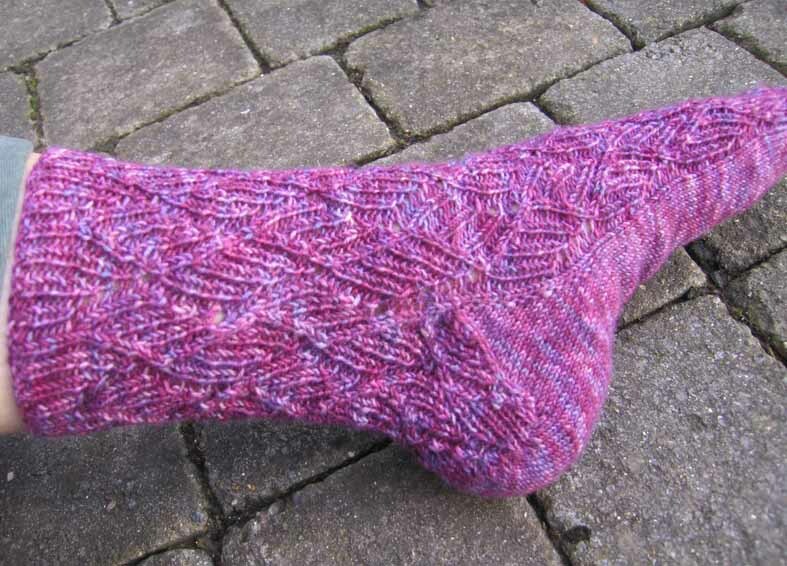 To do a toe-up heelflap in pattern, you must work out how many heelflap rows there will be (which equals the total number of gusset stitches, because you pick up one per row). Given the number of rows, you then start from what will be the next row on the instep and subtract the number of heelflap rows from the rows of the pattern. For example, this was a 24-row pattern. I stopped the instep on R23, so R24 was next. I just happened to have 24 rows in the heelflap, so started the flap on R1 of the pattern. Serendipity reigns only so long; I had to re-work the corners of the gusset several times to get the stitches to do what I wanted. I’m learning to do that, but must spend some time finding a good yarn for summer wear. I hate the cottons I’ve tried!Let me know if you’d like to try some of Kirsty’s – it really does feel good. ‘Woollier’than Cherry Tree Hill, softer and thicker than Lorna’s Laces. What pleasing-to-the-eye socks! Thanks for the explanations you often provide in your posts (such as the patterned heel). I’ve yet to do a toe-up at all. Love the socks! I might try these next. The pattern looks interesting to knit & the colour & the yarn are just fab!